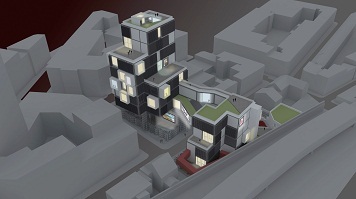 Work by London South Bank University (LSBU)'s cohort of architecture students will go on display in the Student Centre for LSBU's annual Architecture Exhibition which opens on 30 June. The LSBU Architecture Exhibition 2015 features models, drawings and films produced by students from all years of the LSBU undergraduate and postgraduate architecture courses. It presents the results of cutting-edge architectural design projects undertaken in response to an extraordinary range of topics that students have been researching, exploring and debating over the past year of their course. The exhibition reveals the students' commitment to making creative and innovative architecture, and in particular is informed by their engagement with London, its citizens and its culture. Students have also addressed real-world architectural problems, such as the impact of globalisation on design projects, the need for efficient and sustainable building in cities and the benefits of advanced and innovative digital technology on architectural design. Visitors to the exhibition will experience critical work that is informed by close observation of current conditions but will also enjoy work which reflective and speculative in nature. Mary Jane Rooney, Director of Architecture at LSBU, commented: "At this time of year there is a flurry of activity across the school. Teaching has stopped for the summer and during the end-of-year exhibition we review and celebrate the year's work. The projects, drawings, and writings in this exhibition transmit the energy and DNA of the students, staff, alumni and practitioners who come together to learn and teach here. It is a good time to reflect upon all that we do at LSBU, and the creative design of spaces and architecture that the students achieve." The 2015 LSBU Architecture Exhibition takes place in the Student Centre, London South Bank University, 103 Borough Road, London, SE1 0AA. It is open Tuesday 30 June (private view) 6.30-9pm; Wednesday 1st July – Friday 3rd July 10am-8pm. Admission is free.